2017 was the first year that smart speakers became extremely popular as Christmas and Chanukah gifts. Amazon, who created the category in 2015 with the Amazon Echo, has a huge lead in market share over Google and its Google Home series. This past holiday shopping season saw both Amazon and Google fight over market share by cutting the price on their low-end smart speaker. Combined, both firms have a large lead in smart speaker market share. During the holidays, the Amazon Echo Dot and the Google Home Mini were both priced at $29. Both were about $50 prior to the sale. Amazon's cost to produce the Echo Dot is roughly $31 a unit according to ABI Research. And while it takes only $26 to build the Google Home Mini, the $3 gross profit was eaten up by overhead, shipping and other costs. That means that both Amazon and Google took a little hit to the bottom line, just to try and increase their smart speaker market share. A fight for market share could be bad for Apple, whose HomePod was originally expected to launch in December. Apple hinted that its smart speaker was not ready for prime time, and the device is now supposed to hit the marketplace early this year. Priced at $349, Apple is trying to place the HomePod as a premium model. However, both Amazon and Google have a huge head start over Apple. 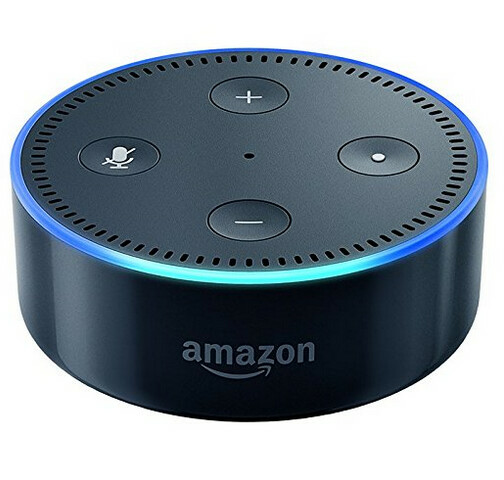 Talking about the big discounts that Amazon and Google gave to Echo Dot and Home Mini buyers this past holiday season, IHS Markit senior analyst Paul Erickson says, "That kind of pricing is great for consumers and bad for Apple," Echoing that sentiment is Adam Wright, senior research analyst at IDC who predicts that "Apple is in a bit of trouble." Wright adds that not including smart speakers received for the U.S. Christmas holiday, 35 million units of the device have been installed worldwide. Let them have some fictional fun until Samsung jump in and crush them all for once. That proves Samsung always follow and copy someone else. The word Illegal does not fit the idea. You're username contradicts your words. Samsung already have a smart speaker out there, since they own Harman Kardon they're the ones making and selling the Cortana based one. I'm not sure where you can buy it, though. I doubt Samsung is spending any marketing money on it and Microsoft seems to be fully focused on marketing their tablets. Really? ?, just like tizen phones did? samsung just needs to make a speaker with Google assistant with some Samsung only commands like what LG is doing. Unless more manufacturers start offering smart speakers for less than $50, then of course the market is going to be dominated by Amazon and Google. The problem with smart speakers is that while there is some functionality one might use on a daily basis like asking it to play music or turn on or off the lights, there isn’t much functionality beyond that (at least at the moment). So you have to either lower the buy in or you have to dramatically increase functionality in order to prove its worth. The $50 or less price allows people to dip their feet in the water with smart speakers and stick around until there is a huge breakthrough in functionality. What exactly do you expect from a smart speaker? I'd say the current functionality is well worth the price if your home has a bunch of items that can interact with it. And if Apple does end up releasing a premium model smart speaker at $350 or so, there will always be those Apple fanatics who will buy one simply to show it off to their family and friends. I don't have much smart technology in my house so I can do without a smart speaker for now to control any of it. A coworker of mine however has a wide variety of connected devices, smart TV, fridge, heating, lights, sound system, washing machine and he's really into having all that stuff interconnected so he'll soon get one, no doubt. I for the moment don't see much use to it. Well as your own comment says: you don’t own a smart speaker. I have three of them right now, including an Echo Show. And while I love having them, I can see where a lot of people may be sitting out until it has more functionality. Because there are still things that it doesn’t do that I know that they are working on. I would just say this: if you have a smart speaker you understand the uses and limits of it. It would be hard for me to explain in a small comment about what I wish it would have access to but those that own them would understand better. These smart speakers should'n even be compared to HomePod, HomePod audio quality will be miles ahead of these. These aren't for audio people. Google home Max is and the price is higher than HomePod. Had an Echo since late 2014 and now several Google Homes. The two are very different. The Echo you have to memorize the commands to use the device as it requires rigid language. The Google Home you can just say things however it pops up in your head. I think of the Echo as having a command line interface and the Google Home a GUI. Then the GH is just a lot smarter. Was watching TV the other day with wife and a year recap show with a video of Trump and Billy Bush. Wife asks if Billy Bush is related to George Bush. Just say "hey google is billy related to george" without last names and get a detailed explanation on the relationship. Just not possible with the Echo. But the best part about the Google Home is it just integrates much better with the iphone than the Echo. My wife clicks her shutter button on her iPhone and without touching an additional button later walks into our family room and ask for fine details in photos and the TV turns itself on, input sets itself and the iPhone photo appears in 4k on the largest screen in our house. We also have a 4k Chromecast and my wife already used Google Photos on her iPhone. The kicker is how easy to make all of this work. Just buy, plug in and log in and that is it. Google wires it all together for you without you needing to do anything.